Pawn, by Aimée Carter, is a classic Young Adult sci-fi/fantasy/dystopian novel. If you’ve followed my reviews at all you’ll know that I identify classic YA as having a female protagonist, usually in love with someone but from whom she has been separated and she agrees to the separation for the good of all, heaping martyrdom upon her tortured soul. She is filled with pathos and gloom and doom and a bit of resiliency. Kitty Doe is a III – a ranking in her society that guarantees a life of misery and drudgery. It will also separate her from her boyfriend Benjy. But after her test in which she was placed as a III (because she’s bad at test-taking) she is approached by a representative for the Prime Minister who offer to make her a VII (a nearly unprecedented ranking for anyone not a member of the ruling family). The catch? Kitty must become a double for Lila Hart, the Prime Minister’s niece, much beloved by the people, who died recently, though her death was never released to the public. Kitty is selected because of her unique blue eyes which are so close to Lila’s. But Kitty must undergo a “Masking” process in which her entire body is physically changed to resemble Lila’s. Even her voice is changed. What Kitty discovers is the usual dysfunctional ruling family and a level of inequality that she couldn’t have imagined. She has her allies on the inside, who teach and lead her, and when Benjy is brought in to be an assistant to Knox (Lennox Creed) a member of the ruling family who was mostly famous for his partying (and also Lila’s fiance). As much of a shock as this is, Kitty’s biggest shock is yet to come. Author Aimée Carter’s writing is very slick and easy to read and the story really moves along quickly. It was because of her writing that I enjoyed the story as much as I did. Plot-wise…I wasn’t terribly impressed. First, there’s the whole idea of the ‘masking’. In this world there is the technology available to completely change a person’s appearance (they even made her legs longer) and implant something in the voice-box to change the sound of the voice … why was Kitty necessary? Couldn’t they make these changes to anyone? Ah, yes … it was because of her eyes. The technology exists to change everything … height, voice, facial structure … but they can’t come up with a way to change eye color? That’s a real level of suspension of disbelief that is being asked of the reader. The world-building itself never really makes sense. It’s okay to not explain away everything … to reveal things as we go, but this world is never explained. Only the immediate actions and consequences are explained. But how did we get here? Who are the Blackcoats? It’s as though it’s just a bad world, or a bad time in our world (doesn’t really matter, apparently) and that’s supposed to be enough for the reader. Most of the plot isn’t terribly unique. Girl is in love with guy. Loses guy. Must marry wealthy, handsome other guy to save everything she loves. Girl rebels against it in every way she can, while strictly following the rules. Does this not sound like every other dystopian YA book out there (including Hunger Games and Divergent). There is a twist that I have to admit that I didn’t see coming which definitely added some intrigue, though probably more-so for the next book(s) in the series. Overall, it was easy to read, which was certainly pleasant, but the world-building and characters didn’t pull me in enough to make me anxious for the next book. Looking for a good book? 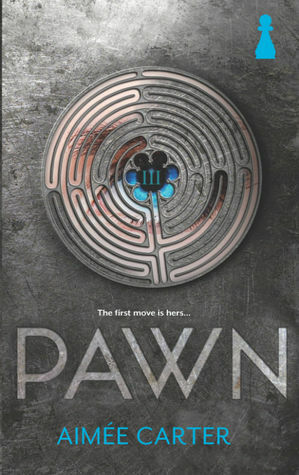 Pawn, by Aimée Carter, is a dystopian YA novel (ala Hunger Games) with a couple of twists and easy to read, but doesn’t reach too deep or gather a lot of steam in this book.